A NASA space probe designed to map the afterglow of the Big Bang -- the fossil light from the creation of the universe 14 billion years ago -- was launched into space on Saturday atop a Boeing Delta 2 rocket. Liftoff occurred right on schedule at 3:46:46 p.m. EDT (1946:46 GMT) from pad 17B at Cape Canaveral Air Force Station in Florida. After an 85-minute flight of the three-stage rocket, the Microwave Anisotropy Probe was successfully released while flying over the Pacific Ocean northeast of Hawaii. "Our job is to give MAP a safe ride into space," Boeing Mission Director Joy Bryant said. "We have put enormous time and effort into ensuring its success. Today all of that hard work paid off." "We're off to a fantastic start," said Clifton Jackson, MAP mission systems engineer at NASA's Goddard Space Flight Center. "Everything is looking good so far." The launch is just the first leg of MAP's journey to its final destination -- a spot one million miles away where it will operate to paint a full-sky picture of the cosmic microwave background radiation left over from the Big Bang, giving scientists a better understanding of the universe's origin and fate. The 1,850-pound craft was hurled into an extremely elliptical orbit ranging from about 110 miles to 180,000 miles above Earth. MAP will make three of the looping orbits -- called phasing orbits -- over the next month, each being raised so the high-end ultimately reaches nearly the distance to the moon. 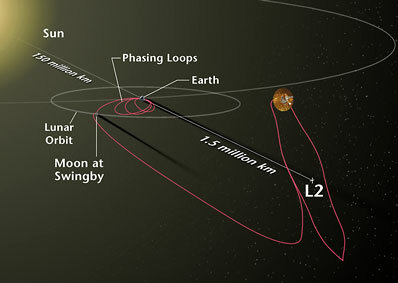 Then, in August, the moon will move into the right position and MAP will swing out and receive a sling-shot boost from the lunar gravity, propelling the probe on its way to the second Lagrange Point (L2) a million miles from Earth in the direction opposite the Sun. MAP will become the first satellite to orbit at L2 -- a point where the combined gravity of the Earth and sun will keep the satellite in lockstep with its home planet, always forming a straight line from sun to Earth to MAP. "L2 is a very good place for MAP because it is far from the Sun's and Earth's microwave emissions, which are a billion times stronger than the signal we are measuring," said Elizabeth Citrin, MAP project manager. "And it allows MAP to avoid night/day cycling as the solar arrays always face the Sun and the instrument is always shadowed. The instrument is cooled to about 300 degrees below zero Fahrenheit." At $160 million MAP is a relatively low-cost mission, however, scientists believe the probe will answer age-old questions about how the universe formed, its structure, evolution and ultimate fate. "It's a modest-price mission but with an enormous appeal," said Dr. Alan Bunner, director of NASA's Structure and Evolution of the Universe Theme. "The whole science community is agog about this mission because it is going after such fundamental science questions." MAP will observe light from a period 400,000 years after the Big Bang -- a time before there was any stars, galaxies or quasars. This light -- cosmic microwave background radiation -- was first observed in 1965. The radiation has virtually the same temperature in all directions in the sky. 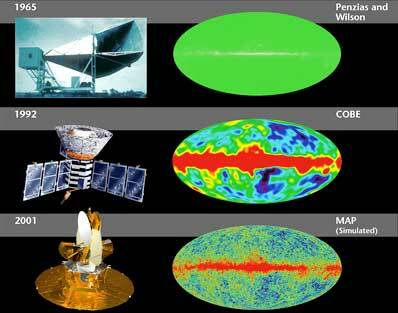 But NASA's Cosmic Background Explorer (COBE) satellite discovered tiny fluctuations, or anisotropy, in the temperature nearly 10 years ago. MAP's goal is to capture a couple billion measurements to produce a high-accuracy, full-sky picture of the temperature variations to the millionth of a degree. "The cosmic microwave light is a fossil," said David Wilkinson of Princeton University, NASA's partner in the MAP mission. "Just as we can study dinosaur bones and reconstruct their lives of millions of years ago, we can probe this ancient light and reconstruct the universe as it was about 14 billion years ago." By taking a "fingerprint" of the early universe, astronomers will be able to compare the MAP data against the many scientific theories about the cosmos to determine which one is correct. Since each theory predicts a specific fingerprint, MAP should show which is the true cosmic scenario, thereby determining the universe's age, how fast it is expanding, whether the expansion is accelerating. "One problem we have in cosmology is we are trying to make a coherent idea of how the universe formed," said Dr. Alan Kogut, a MAP science team member. "We can look around us today with optical telescopes like the Hubble and see very clearly where things are in the universe today -- where the stars are, where the galaxies are. "But you say 'how did these stars and galaxies form?' That's a much more difficult question because no one was around when they formed. So if we look at the microwave background radiation that was given off shortly after the Big Bang we can, in effect, get a baby picture of the universe before these structures formed. "And then we have a clear picture of how the universe used to be -- billions and billions of years ago -- and connect that with a very clear picture of how the universe is today, there is only certain many ways you can get from here to there. "Therefore, if you have this clear picture of how the early universe used to be you can decide whether your theories of what is holding the universe together, how does a galaxy form, how do stars form, whether these are correct or whether there is something new to be learned about the universe." Patterns encoded in MAP's full-sky picture -- expected to be completed in about two years -- could answer such questions as: What happened during the first instant after the Big Bang? How did the universe evolve into the complex patterns of galaxies that we see today? Will the universe expand forever or will it collapse? The patterns will correspond to tiny concentrations from early in the history of the universe. "These concentrations were the seeds that grew to the stars and the galaxies we see today," said Dr. Charles Bennett, the MAP principal investigator. 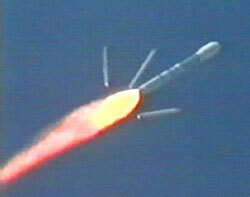 Saturday's launch was the 286th for a Delta rocket dating back to 1960 and the 97th of a Delta 2 vehicle since 1989. 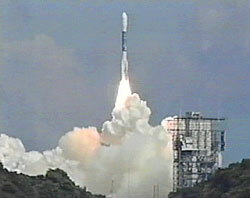 The success extended the Delta 2's consecutive string to 42 since 1997. July 30: Launch from Cape Canaveral of NASA's Genesis spacecraft that will collect samples of the solar wind for return to Earth. September 15: Dual launch of NASA's TIMED atmospheric research satellite and the French/U.S. Jason-1 oceanography craft from Vandenberg Air Force Base in California. 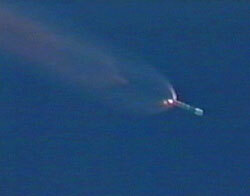 October 18: The Vandenberg launch of the commercial QuickBird-2 Earth-imaging satellite. 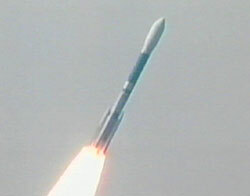 December 20: Launch of NASA's Aqua Earth Observing System spacecraft from Vandenberg. Launch windows - See the launch opportunities for MAP given the required lunar alignment. Delta 2 rocket - Overview of the Delta 2 7425-model rocket used to launch MAP. 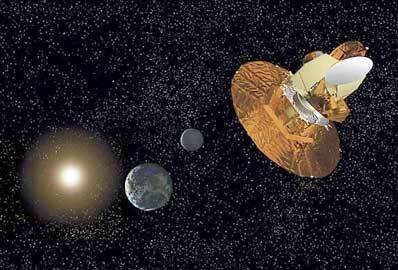 Microwave Anisotropy Probe - Technical look at the spacecraft and its systems. Mission science - Overview of the scientific objectives of MAP.